By J. Charles Delbeek, M.Sc. When one thinks of coral reefs, images of gin clear, nutrient poor blue water spring to mind. While there are certainly many examples of this, there are also many more examples of coral reefs in less clear, nutrient rich waters. However, compared to typical closed system tropical marine aquaria even these less ideal locales probably exhibit lower levels of dissolved nutrients than closed marine systems. Due to the actions of biological filtration, feedings and heterotrophic bacteria, nutrient levels in closed systems often exceed those of in situ coral reefs by a factor of 100 or more. Crystal clear waters on a reef in the Solomon Islands. Nutrition of corals is also gaining added importance as simply providing enough light is not adequate to keep corals in a high state of fitness. This high fitness level is essential for the production of gametes. The days of corals merely growing being a sign of success are gone as a renewed interest in spawning and propagating corals has resulted in a renewed emphasis on providing feeds to corals. With this increased input of nutrients comes an equal increase in nutrients such as nitrogen and phosphorus, which must be dealt with either via the life support system (LSS), by system maintenance routines or by a combination of both. 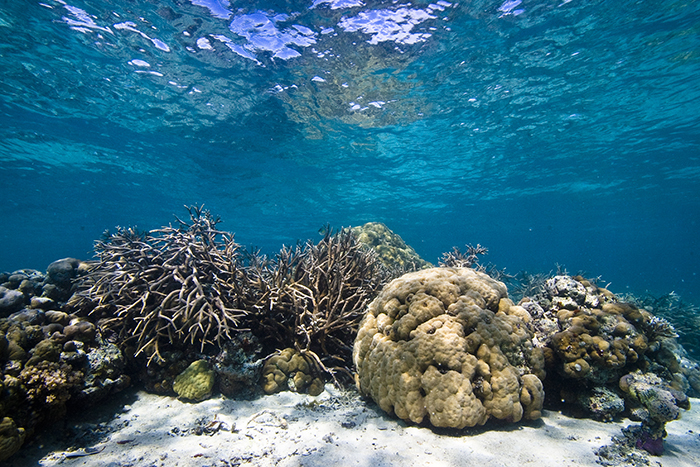 It is therefore necessary to maintain water quality to allow for corals to be able to thrive. But questions have now arisen if maintaining low levels of nutrients is really critical and discussion of systems which much higher levels of phosphorous and nitrogen are taking place (see Ross and Jury, 2014). Reefs occur in a wide range of environments, such as this reef in the lagoons of Palau. Photo B. Carlson. I have lost count over the years how many times I have heard hobbyists dismiss advice with the retort that their corals are growing and how they strive to make them grow faster still. Of course, hand in hand with this comes a strong desire for ever more color in their specimens. In this piece I propose that having a fast growth rate is not necessarily an indication that a coral is healthy and doing well (see also Woodridge, 2014) I’ll also take a look at the recent reports of higher nutrient aquariums doing well (see Ross and Jury, 2014) and offer some suggestions as to what might be going on with these; though I am the first to admit this is only educated speculation. Water Chemistry Parameters There are a variety of water quality factors that are important to maintain in systems that are designed to house live corals. However, there are five that are essential and if they are not maintained at adequate levels, then coral will not be able to thrive. These are: temperature, salinity, calcium, alkalinity, and pH. Together these make possible the conditions needed for corals to be able to calcify which is the process whereby inorganic carbon and calcium are combined inside the coral to create the calcium carbonate skeleton upon which a coral’s tissue resides. High coral cover on a fringing reef of Guam indicates high demand for calcium carbonate. One of the common fallacies still perpetuated by some is that coral reefs are these remarkably stable environments that experience an almost steady-state existence. In reality this is most definitely not the case and is predicated by the location of the reef. Inshore reefs, not surprisingly, can experience significant shifts in nutrient levels, salinity and temperature, and are more susceptible to anthropogenic influences such as silt and sediment run-off, and the resulting nutrient spikes this can bring. Even oceanic reefs, far removed from terrestrial influences are susceptible to temperature swings caused by deepwater upwelling of colder higher nutrient water, periods of ocean warming, and heavy rains and storms which can affect turbidity and salinity. 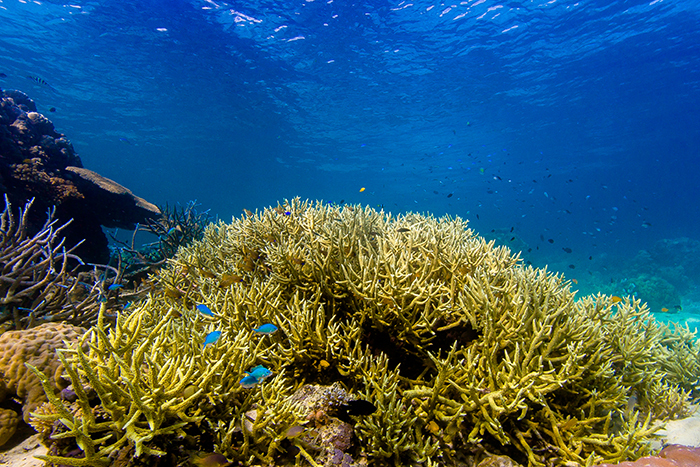 Surprisingly, perhaps, corals occur throughout these areas but their diversity will vary as some species are simply more tolerant of such conditions than others. Corals rely on water chemistry and light in order to build their calcium carbonate skeletons, a process known as calcification. Under the right conditions of calcium, alkalinity, pH and carbon dioxide, two moles of bicarbonate are combined with one of calcium to form calcium carbonate, carbonic acid, which quickly dissociates into carbon dioxide, and water. When combined with photosynthesis from the zooxanthellae algae in the coral tissue this drives the process to the right by taking up carbon dioxide. So one can see the importance of maintaining proper calcium, alkalinity and light levels in corals that contain zooxanthellae. Calcification rates on coral reefs can reach up to 12 kg (26.5 lbs) CaCO3 /m2/year for high energy reef areas with almost total coral cover (Kinsey, 1985). Estimations for closed systems have ranged from 0.5 to 6.5 kg (1.1 to 14.3 lbs) of CaCO3 /m2/year (Carlson, 1999). It is possible that closed system coral tanks could have even higher calcification rates when alkalinity is boosted and the surface area is dominated by fast growing corals such as Acropora as well as coralline algae, and calcification rates of 20 kg (44 lbs) of CaCO3 /m2/year could be expected (Bingman, 1997). That is a lot of calcium and bicarbonate that would need to be supplied to such a system that would only scale up with size. Therefore, any calcium carbonate replenishment system will need to be able to meet that demand as the system grows. Factors that Affect Coral Growth (Linear Extension)Temperature One of the controversies that I weighed in on almost 15 years ago was the correct temperature at which to keep a reef tank. I had always maintained keeping it somewhere below 27 oC (80 oF) while others argued that it should mimic natural reefs and could run as high as 32 oC (87 oF) (Shimek, 1997). While it is true that some very high diversity reefs can occur in areas where water temperatures can run up to 32 °C (87 °F) for extended periods, such temperatures are approaching the thermal maximum for most corals; especially those that do not come from habitats that normally experience extended periods of high temperature e.g. tide pools. Today, with reports of coral bleaching occurring more frequently, it is not surprising that temperatures just a few degrees above the annual average can result in coral bleaching and greater susceptibility to diseases. In general, coral growth (annual linear extension) rates in the tropics are found to be negatively correlated with annual mean SST, and this relationship is often used to reconstruct past sea surface temperature (Cantin et al., 2010). However, experiments have indicated a parabolic relationship between coral growth (calcification and/or linear extension) and SST (Jokiel and Coles 1977; Jokiel and Coles, 1990), with highest growth rates found at temperatures 1 to 2 °C below the mean annual maximum but if the temperature increases just a few degrees (1-2 oC) above the peak seasonal high a drop in calcification rate results (Marshall and Clode, 2004). Therefore some corals grow faster at a higher temperature than other corals that may come from cooler areas. The real question is whether or not corals can change their thermal maximums over time as they adapt to a new environment. See pages 133-139 in Delbeek and Sprung (2005) for a more in-depth discussion of the ideal temperature for a closed reef aquarium system. pH The pH of seawater can vary depending on locale, but can range from 8.0 to 8.5. Calcifying organisms such as corals tend to calcify best at a pH of 8.2-8.5 due to a variety of factors such as calcium and alkalinity availability, and carbon dioxide levels. If the pH consistently runs between 7.6-8.0 then be sure the alkalinity runs at or above 3.0 meq/L to compensate as corals can still calcify at lower pH provided alkalinity is high enough (Delbeek and Sprung, 2005; Comeau et al., 2012). The pH level of a coral aquarium is just one part of a complex system that also includes calcium, carbonate alkalinity and magnesium. These four factors, along with temperature, all interact to create an environment that is conducive to the process of calcification by which organisms such as corals can create their calcium carbonate structures. Therefore it is vital that these factors be considered together and not as individual components of water quality for a live coral aquarium. Alkalinity Typically seawater alkalinity can vary between 2.1 and 2.5 meq/L depending on location, with a value of 2.3 meq/L considered average. In closed systems, a range of 2.5-3.5 meq/L is generally recommended with a target of 3.0 to 3.2 meq/L considered ideal. These higher than normal levels provide sufficient carbonate and bicarbonate to balance the negative effects of elevated nitrogen and lowered pH and allow for enhanced calcification rates (Marubini and Thake, 1999; Comeau et al., 2012). Calcium Calcium forms the main building block of a coral’s skeletal components. As such, all things being equal, without sufficient calcium a coral will not be able to build a healthy skeleton. Natural seawater levels of calcium can vary depending on location and salinity and can range from 380-480 mg/L (Delbeek and Sprung, 2005). Calcium levels in aquaria with corals should fall between 420 and 450 mg/L. Values as low as 360 mg/L can be fine too just so long as alkalinity levels remain in balance, or even higher, with calcium levels. Values much higher than 450 mg/L can lead to active precipitation of calcium carbonate followed by a rapid loss of calcium and carbonate, particularly if the calcium and alkalinity are not in balance. It is better to maintain natural levels of calcium whenever possible. NutrientsInorganic Nitrogen There are three main forms of inorganic nitrogen of concern in aquaria: ammonium, nitrite and nitrate. The levels of each can be measured and reported in two forms, the nitrogen ion and the nitrogen containing compound. It is critical to know for reporting and comparison purposes, which of these two values are being reported. Most hobbyist literature lists the nitrogen compound (e.g. NO3–, nitrate; NH4+, ammonia) while most of the scientific literature and testing services provide the ionic form (e.g. NO3-N, nitrate-nitrogen; NH4-N ammonia-nitrogen). To further the potential for confusion most aquarium labs report in units of mg/L while most scientific publications report these values in micromolar (μM)units, therefore it is critical to know not only what form is being reported but how to convert between the two units of measurement. A handy online calculator can be used to convert μM values to mg/L for any compound (www 1). 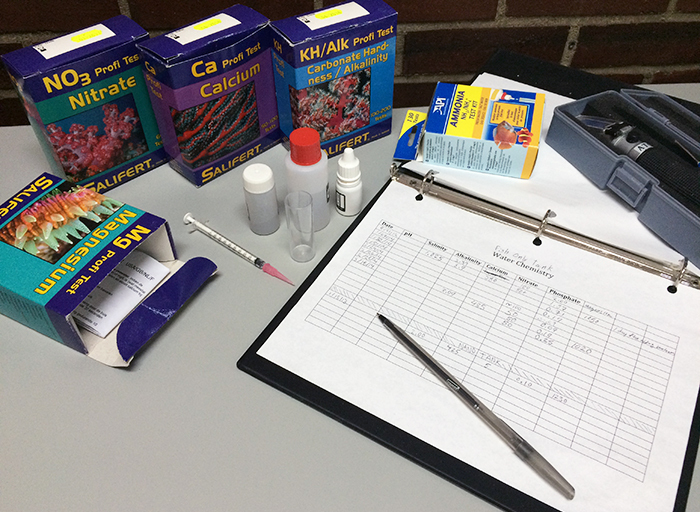 A collection of various aquarium testing kits and tools. Photo by Brian Cook. Ammonia and Nitrite Generally speaking, values for ammonia and nitrite should always be as close to zero as possible. In live coral systems, a slightly elevated level of ammonia in source water is acceptable as the zooxanthellae algae in the corals will readily uptake this as a source of nitrogen. For example, natural seawater levels of ammonia in in-shore water off of the Waikiki Aquarium in Honolulu, run around 0.001 mg/L yet the saltwater well that supplies water to the live coral exhibits has a level of approximately 0.05 mg/L and the corals do just fine. In fact, by the time water exits these exhibits ammonia is barely detectable (Atkinson et al., 1995). One side effect of elevated ammonia is an increase in zooxanthellae and photosynthetic pigments. Several studies on nutrient enrichment of ammonia at much higher levels than at Waikiki (e.g. 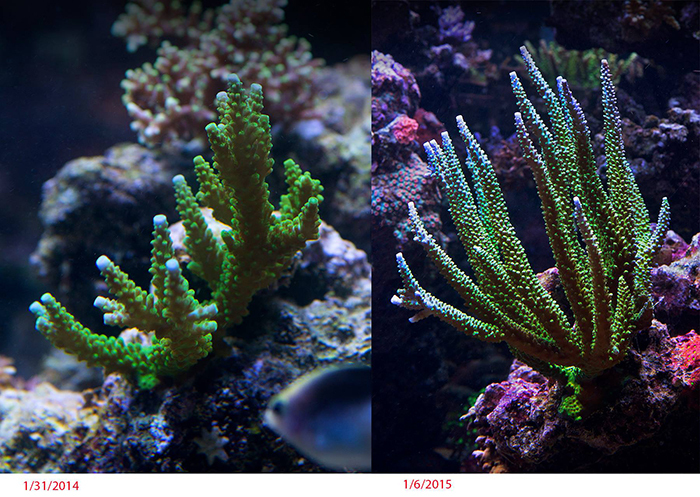 40 μM vs. 3 μM), have shown a decrease in coral growth rate (e.g. Yuen et al., 2008), however, as has already been mentioned, this effect can be offset by maintaining alkalinity above 3.0 meq/L. Most of these studies were conducted at NSW values for pH whereas the Waikiki water has a much lower pH value due to the presence of dissolved carbon dioxide which results in a high calcium carbonate saturation state, facilitating calcification. However, the price for coral growth in higher nutrient water is that the skeleton produced is less dense and hence more brittle, which has been observed in both corals and giant clams that were grown under higher levels of ammonia and nitrate (Fitt et al., 1993; Carlson, 1999; Marubini and Flake, 1999). Corals will also darken in color as the number of zooxanthellae increase as well as an increase in pigment density. However, prolonged elevated levels of ammonia can also affect coral fecundity and fertilization of coral gametes, so this needs to be taken into consideration if sexual reproduction of corals is a goal of the system (Harrison and Ward, 2001). Acroporid corals have lower fecundity, egg size, fertilization rates, and embryo development at even very low levels of nitrogen concentration of 1 μM NH4 (0.02 mg/L) (Fabricius 2005). Gametes from the brain coral, Goniastrea aspera, have a less of a chance of developing into regular embryos and a higher chance of being deformed from ammonium concentrations as low as 0.5 μM (0.01 mg/L) (Harrison and Ward 2001) and these effects become stronger as concentration increases. Nitrate Nitrate (NO3) levels around coral reefs can vary depending on location and season but generally they are rarely above 0.05 mg/L (D’Elia, 1988 in Delbeek and Sprung, 1994). Such levels can be obtained in closed systems (Delbeek, unpublished data) but usually levels range from less than 1.0 to 40 mg/L or even higher. Nitrate has a number of effects on corals. As previously mentioned, nitrate can act as a source of nitrogen for zooxanthellae, enhancing their numbers causing the coral to darken in color. The increase in algal cells also increases competition for inorganic carbon which can result in decreased coral skeleton growth though this can be offset by increasing the level of carbonate alkalinity (Marubini and Atkinson, 1999; Marubini and Thake, 1999). Nitrate has also been shown to increase the rate of disease progression in corals (Bruno et al., 2003). For example the progression of diseases such a black and yellow band disease can increase when nitrate levels are elevated (Voss and Richardson, 2006). Aside from these direct effects indirect effects can include increased algal growth in the system that can outcompete the corals for growing space as well as nutrients. In a survey of 16 coral systems at public aquaria Brittsan (2004) found that NO3-N levels ranged from a low of 0.13 mg/L to a high of 10 mg/L, this equates to 0.57 mg/L and 44 mg/L of NO3 with a mean of 12.2 mg/L NO3. The general recommendation is to keep nitrate below 1.0 mg/L with a range of 0 – 10 mg/L considered acceptable (Borneman, 2008). While these are certainly acceptable ranges, there are also instances where higher levels of nitrate have occurred in closed coral systems with no apparent negative effects, which we shall examine shortly. Inorganic Phosphorous Phosphorous is a necessary component for life but as with so many things too much of a good thing can lead to problems. As with nitrogen, inorganic phosphorous levels can be reported either as phosphate-phosphorous (PO4-P) or phosphate (PO4, also known as orthophosphate) and results can be reported as either μM or mg/L, therefore as with nitrogen it is critical to know which format test results are reporting and in what units before you start comparing numbers. Levels for orthophosphate on reefs are dependent on a number of factors such as proximity to land, urban centers, river estuaries and periodicity of deepwater upwelling. Values can range from less than 0.01 mg/L to as high as 0.07 mg/L (D’Elia, 1988 in Delbeek and Sprung, 1994). Brittsan (2004) reported a range of 0.01 to 1.3 mg/L phosphate amongst 16 public aquaria surveyed with a mean of 0.28 mg/L. Generally it is recommended to keep phosphate levels as low as possible with levels somewhere between 0.03 and 0.08 mg/L considered ideal (Brittsan, 2004; Borneman, 2008; Delbeek and Sprung, 2005). However, there is no denying that successful coral exhibits can be found that have considerably higher levels of phosphate i.e. 1.25 mg/L (Ross and Jury, 2014). The real question is why? 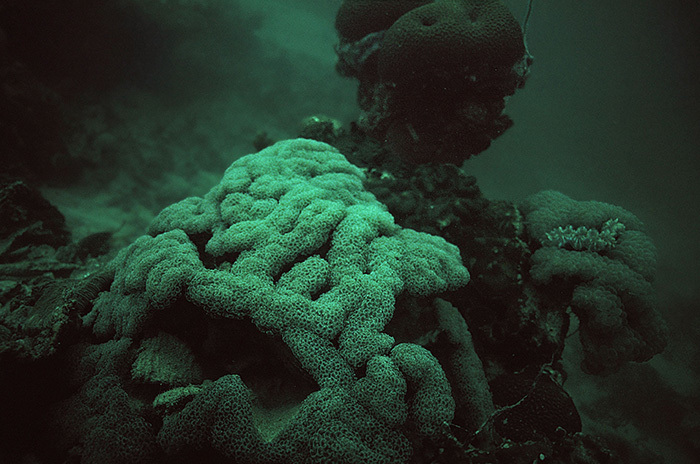 It is generally felt that high levels of phosphate promote excessive undesirable algal growth, interfere with calcification producing less dense calcium carbonate skeletons, increase incidences of coral diseases and bleaching, and an increase the number of zooxanthellae present in corals resulting in darker colonies and a greater demand for bicarbonate, hence the decrease in calcification rates (Bruno et al., 2003; Delbeek and Sprung, 2005; Dunn et al., 2012; Pawlowsky, 2008; Vega–Thurber et al., 2014). However, experiments to determine the effects of increased phosphate levels on coral growth are mixed, with some species showing increased growth, some showing a decrease while others exhibited no difference. There can even be variation within a species for example Acroporalongicyathus showed no increase in growth at 0.22 mg/L PO4 whereas at levels of 0.48 mg/L it did while in another study the opposite occurred where levels of 0.204 mg/L had no effect on calcification in Acropora cervicornis but at 0.393 mg/L it decreased (in Dunn et al., 2012). Using scanning electron microscopy Risk and Sammarco (1991) demonstrated that the lower skeletal density that results from increased nutrients such as phosphate was due to increased porosity and a decreased in thickness in the structures of the coral polyp calice itself. 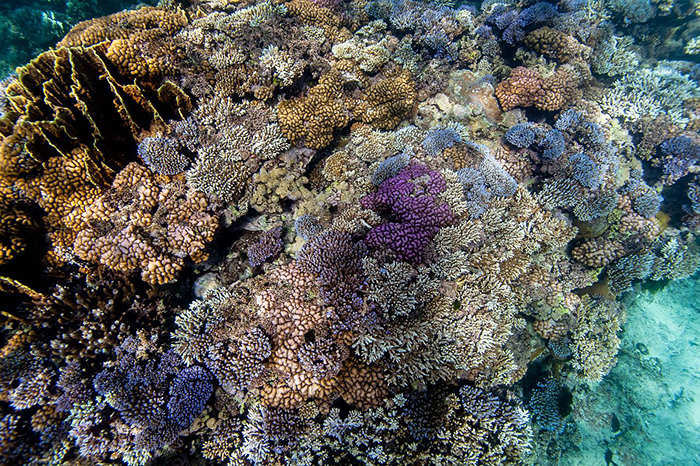 Nutrients and Coral Health While high levels of nutrients are often cited as reasons for reef decline, there is a lot of conflicting research on the subject. In some cases, elevate nutrients were detrimental to some species studied but not others, in some studies elevated nutrient levels had little detrimental effects on any of the species studied, and in studies looking at the growth and reproductive success of corals grown under high nutrient areas such as beneath open ocean fish farms, they actually grew faster and had larger oocytes (Bongiorni et al., 2003; Langdon and Atkinson, 2004). Some of this conflicting work can be explained by the level of nutrients used, the duration the nutrients were maintained at a high level and the nature of the nutrients present or used. In closed system it seems to be fairly well-established through experience (Delbeek and Sprung, 2005; Pawlowsky, 2008) and experimental evidence (Marubini and Thake, 1999) that maintaining elevated levels of alkalinity can overcome limitations on coral growth caused by elevated levels of nitrogen and phosphorous. What is not clear is what are the upper limits that these two nutrients can reach in closed systems and still be tolerated by corals due to high alkalinity levels. Therefore the reports of success under much higher than generally accepted nutrients (Ross and Jury, 2014) can be partially explained by the fact that the alkalinity levels in these systems is higher than natural seawater. The trade-off is that these skeletons are most likely less dense than wild colonies (see Carlson, 1999). There is also evidence to suggest that when nitrate is elevated and phosphate is not, that corals are more susceptible to bleaching that is both light and temperature mediated, but if both are elevated, the zooxanthellae increase in numbers and the coral becomes darker and is not as susceptible to bleaching (D’Angelo and Wiedenmann, 2014; Wiedenmann, et al., 2013). Using mass spectrometric analyses of the algal lipidome they found a marked accumulation of sulpholipids under these conditions together with increased phosphatase activity. Together these changes suggested that the imbalanced supply of dissolved inorganic nitrogen resulted in phosphate starvation of the symbiotic algae. Therefore it is tempting to speculate that having both elevated P and N in an aquarium might be okay, but having only elevated N but lower P is not. Lost in this discussion are the other affects that elevated nutrients can have on coral health besides growth and zooxanthellae such as fecundity and disease resistance, both factors that need further investigation in these “unnatural” home aquaria. Under the right conditions captive corals can grow rapidly, but is this necessarily a good thing? Photo by Sanjay Joshi.